Home CDN , children , crafts , feature , February , holiday , holidays , homeschool , papercrafts , printables , US , worldwide February 12th - Featuring Abraham Lincoln Freebies! 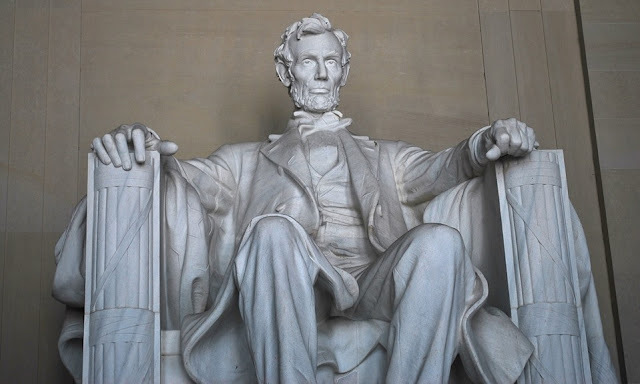 February 12th - Featuring Abraham Lincoln Freebies! -- Every American knows President Abraham Lincoln, the 16th President of the United States. Honest Abe, as he was commonly known as, was born in the wilderness country of Hardin County, Kentucky on February 12, 1809. Abraham Lincoln became president in 1861. • The Speeches and Writings of Abraham Lincoln -- Abraham Lincoln, America's heroic Civil War president, was also the greatest writer ever to occupy the White House. His addresses at Gettysburg and at his inaugurals, his presidential messages, and public lectures, are an essential record of the war and have forever shaped the nation's memories of it. This deluxe two-volume boxed set gathers Abraham Lincoln: Speeches and Writings 1832-1858 and Abraham Lincoln: Speeches and Writings 1859-1865, first published in 1990, which together have been hailed as the best selection of Lincoln's writings available today, perhaps the best ever (Christian Science Monitor). - You find them scattered about on the streets. They are tossed into coffee cans and shoe boxes and left, if not forgotten. They do slightly help in paying escalating taxes. Surprisingly, enough of them will add up significantly over time. How many pennies will you find today? - Why is Plum Pudding called Plum Pudding when there are no plums in it? In the 17th century, plums referred to raisins or other fruits. Plumb is another spelling of plum. Prune is actually derived from the same word as plum - the Latin word was Pruna, which changed in the Germanic languages into pluma. But the terms were quite confused in the 16th and 17th centuries and people talked about growing prunes in their garden. - A recently instituted celebration intended to commemorate the anniversary of the birth of Charles Darwin on February 12, 1809. The day is used to highlight Darwin's contribution to science and to promote science in general. - Founded in 1909, NAACP (National Association for the Advancement of Colored People) is the nation's oldest and largest civil rights organization. From the ballot box to the classroom, the thousands of dedicated workers, organizers, leaders, and members who make up the NAACP continue to fight for social justice for all Americans. - According to the people of Bangor, Maine, Paul Bunyan was born there on February 12, 1834. Some say Paul Bunyan is based on a French-Canadian timberman named Fabian Joe Fournier (aka Saginaw Joe by some) who was born in Quebec, Canada in 1845. He moved to the Saginaw, Michigan area after the Civil War and was hired as a foreman (aka boss logger) of a logging crew. Since he was a large guy and pretty strong, and was also good with an ax, he was soon called the top feller in the woods. - First introduced to the world on February 12, 1985, at a news conference in Washington, D.C., by award-winning actress Rita Moreno who served as a spokeswoman. Safetypup® makes learning about safety issues fun, entertaining, and non-threatening. Safetypup® has become familiar to hundreds of thousands of children from all over the country who view Safetypup® as a trusted friend.